We first became addicted to the wines from Bourgueil when we shared a bottle over a pleasant lunch in Paris. When we planned our first Loire excursion we looked for an organic producer from this area and Stéphane Guion seemed to fit the bill perfectly having been one of the first to adopt organic practices in this area. The estate has been certified organic since 1965! 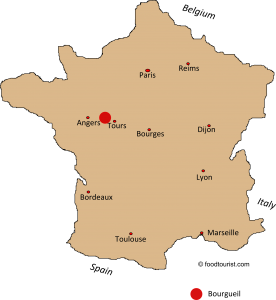 The Bourgueil appellation area is centered on the village of the same name which lies a short distance to the west of Tours. It is a red wine only appellation where Cabernet Franc is king with Cabernet Sauvignon allowed to play a supporting role (rosé wines can also be made from these grapes as well). He only produces two main cuvées of red wine from his aged vines which range from 35 to 80 years old. He also produces a delicious rose wine. But the main thing about the Bourgueil area is that it lies on south facing slopes that are exposed to the sun, so that means that the notoriously difficult Cabernet Franc grape ripens really well here. 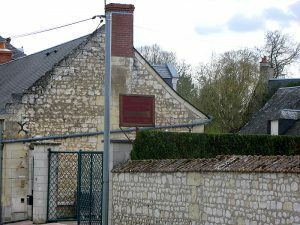 Stéphane’s house (in the picture on the left) and winery (the building just on the right of the photo) are in the quiet, sleepy village of Benais which lies just a few kilometres from Bourgueil. Here nearly every house is made from limestone which has been quarried from a nearby hill (where, incidentally) Stéphane’s best vineyard is situated. The stones carved out of the hillside were painstakingly removed to form long passages like mine addits. They were then transported to Benais and the village was built on the back of these labours. When we visit his house we are acutely aware that it sits atop of his ancient cellar where some of the most amazing treasures are stored. We often descends into the cellar and brings up a 20 or 30 year old bottle of his wine that is always perfectly preserved and ready to drink. Don’t let anybody tell you that natural wines don’t last! 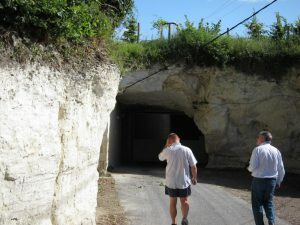 You can walk into these “caves” for a long distance and it is here that Stéphane and other winemakers store their wine while it is maturing as the temperature is perfect for maturing wine with no perceptible change in temperature even at the heights of summer.Getting into the caves is an interesting experience. You enter the long tunnel from the entrance carved into the hill shown above. Far inside this man-made cave there is a strongly locked iron gate and to the left you can see the traditional miners “board” where there are hooks numbered 1 to 12. 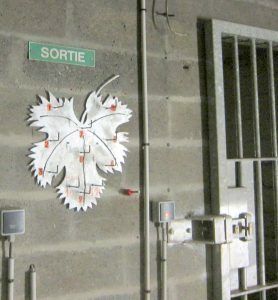 The vigneron who is entering their cave puts a marker on the hook that represents their cave to indicate that they are inside. When they leave they replace the marker. This way no-one inadvertently gets locked in or in an emergency rescuers can tell immediately in which cave to look. Stéphane is a quiet, thoughtful man who takes his winemaking very seriously and we think that results speak for themselves.His wines are natural because the vines are tended organically (and have been since 1965), he only uses the natural yeasts on the fruit to ferment the wines and there are no additives with the exception of very low amounts of sulphur added during bottling to preserve the wine on its long journey out here. He has certification from Ecocert for his organic vineyard as shown on the labels. And, even though these wines are sold at a very, very good price, they will last for many years if you want to tuck a few away. We have tried examples of Stephane’s wines that are over 25 years old and they are still fresh, vibrant and exciting to drink.These wines represent the most sensational value for money you are likely to find. They are great wines at a great price! The vines used to produce the Domaine cuvée are between nearly 20 years old to nearly 50 years old. They thrive in clay and limestone soils that have been organic since 1965. This wine is produced from 100% Cabernet Franc and shows hints of raspberries (and some blackberries) and cherries on the nose. There are fine tannins providing structure to the wine and the wonderful fruit shines through. There is also the characteristic acidity and minerality which adds to the appeal of this wine. Drink this wine with good cheese or a roast dinner. 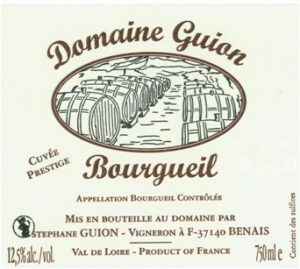 No oak is used in the production of this wine. It represents amazing value for money at this price! This is the first time that we have ever been able to import some of Stéphane’s delicious rosé. He has allocated a small quantity of his rapidly diminishing stocks of this Cabernet Franc and we anticipate that it will sell very quickly. This is a strongly mineral driven wine where the effects of the beautiful limestone soils are clearly evident. Remember that his vineyards have been tended organically for over 50 years and the quality of the soil and the quality of the fruit is a direct benefit of this organic treatment. The result is an incredibly fresh wine even after two years with a fine core of acidity that is keeping the wine alive. You will detect strawberry and stone fruit aromas with hints of spice and citrus on the finish. This is an excellent wine at a very reasonable price considering the quality. 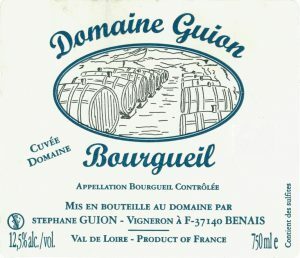 This wine is also 100% Cabernet Franc but has had some oak treatment (old oak barrels, never new oak) and is produced from older vines than the Domaine (these are up to 80 years old). This is a fine, savoury wine with lovely tannins and good length on the palate. There is a streak of acidity running through this wine that will ensure that it will last for many, many years. It represents excellent value for money and is currently drinking very well, but will also last for a considerable time in the cellar.